“Love for Christ, Service to Men and Discipline at all Times”– the mantra which the Knights of Santo Niño (KSN) always live for. Three decades of serving the Basilica Minore del Santo Niño de Cebu (BMSN) as altar servers indicate the loyalty and faith of the people comprising the KSN. KSN is an organization which embodies the sincerity of serving God through advocating young people to be the vanguard of becoming a good Christian. For 30 long years of service, the Knights of Santo Niño continue to live its legacy in transforming young people through living their life in the service of God and the people. Year 1988 on the 16th day of December, a small group of ten (10) young boys initiated the rise of the KSN who shared the same passion and willingness to give service to the Holy Child Jesus through assisting the friars during masses. These altar servers were called Knights of Santo Niño for they became the strong defenders of idealism and of the Mother Church. Because of its members’ determination and heart to serve, the pioneering 10 boys who embody KSN grows into a larger group of young men that is now actively serving the church. The organization is headed by a president who is elected yearly after a thorough process of evaluation. For this year’s batch, the church is blessed with more than 20 full-fledged young men who serve the church. Thirty years of service has made the KSN an organization which transforms its members not only spiritually but also holistically. Years full of commitment and discipline are few of the attributes that made the organization fully established. According to Joneil Benzent Quijano, KSN President Batch 2013, one great differential characteristic which set them apart is that they maintain a certain level of solemnity and perfection in everything they do during the celebration of the Holy Eucharist. The organization serves as a training ground for young men to become a knight who should always know by heart the motto and the goal of the organization. In 2011, the perpetual service and dedication of the KSN was recognized during the annual fiesta celebration of San Pedro Calungsod as they bagged the award of being the “Most Discipline.” This is an activity participated by all altar servers of Cebu. Part of the biggest achievement of the organization is also creating a big impact and difference to the lives of the members where it is manifested through producing 3 priests in its 30 years of existence. “The one who assists the priest, now becomes a priest.” Joneil added. 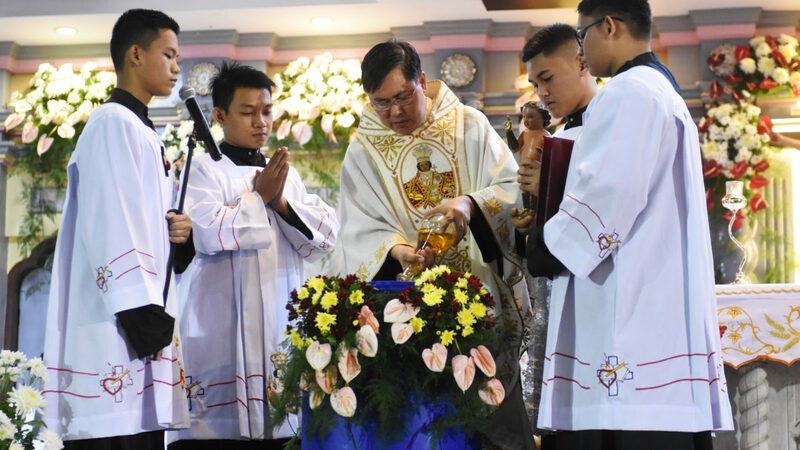 “Serving the mass is already an achievement; other recognitions are already extra icings on the cake.” Daryl Brian Lee, 2007 Batch President said. As their mantra says, the organization aims to create an avenue for young men to share and exercise their faith to God through living their lives for Christ. In celebration of KSN’s 30th anniversary, KSN will continue to conduct Community Outreach Programs to the society which is done yearly during their Anniversary celebration which will happen on the first day of December. Because of the perpetual service and strong faith to God, KSN remains to be the forefront of God’s service through living their lives for Christ. Thirty years of commitment and discipline helped built the KSN to develop their whole self. The passion and willingness keeps the fire burning into their hearts while serving the church.